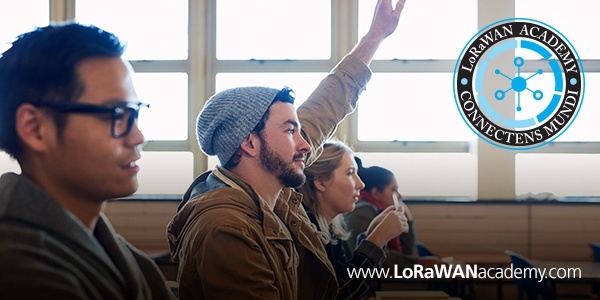 Q: What is included in the LoRaWAN Academy program curriculum? The curriculum consists of 10 weeks of educational learning including video lectures, reading materials, resources, assignments, and quizzes. It is designed to give students extensive hands-on experience with Semtech’s LoRa® devices and wireless radio frequency technology (LoRa Technology), and real-life proficiency in implementing their own Internet of Things (IoT) solution. Students check-in weekly through an online portal hosted on edX, a platform used by Ivy League and other premier universities worldwide. It is through this portal that students access their online lectures, quizzes and learning materials. Learn more about the weekly course syllabus here. Q: Why is LoRa Technology a preferred LPWAN technology? Q: What is the difference between the two network package options? LoRaWAN Academy offers two tiers of starter kits or network packages. The first is a kit for indoor use, which includes hardware and a license to create LoRa-enabled solutions. The second package includes both an indoor and outdoor kit. This package also includes a geolocation-enabled gateway, plus access to geolocation framework. This enables the creation of tracking solutions. The first package is for those with a smaller group of students enrolled in the program, or those without enough space to create outdoor solutions. The second package, is for those seeking a more comprehensive IoT course who have a larger budget to implement the course. No matter which package you chose, students can bet on an informative IoT experience. Q: Who created LoRaWAN Academy? A joint consortium of companies that have deployed LoRaWAN-based solutions internationally sponsors LoRaWAN Academy. They enable cutting-edge IoT applications that make our world smarter. The companies collaboratively contribute to curriculum development, hardware and software, IoT network infrastructure, expert training, and continue to support the program. These companies are: Kerlink, The LoRa Alliance™, myDevices, Semtech Corporation, and The Things Network. Learn about each of our sponsors here. Q: Who are the professors of LoRaWAN Academy? Several experts in the field of IoT created the LoRaWAN Academy curriculum, including: Johan Stokking, Laurens Slats, Maarten Weyn, and Thomas Telkamp. Read more about the instructors, and the course itself on this page. Q: What industry resources are available in support for LoRa Technology and the LoRaWAN open specification? The LoRa Alliance, a nonprofit association of more than 500 members committed to the promotion of the LoRaWAN open protocol and its continued success, has many excellent resources. The LoRa Community™, an exclusive community for LoRa developers, offers many helpful resources including: manuals, data sheets, white papers, use cases, and guides. Lastly, Semtech, creators of LoRa Technology, have a wealth of information including white papers, videos, use cases, and more – visit the LoRa Technology site to read more. Follow us on social media to stay on top of news in regard to LoRaWAN Academy, LoRa Technology and all things IoT!